The book launch today was a resounding success. 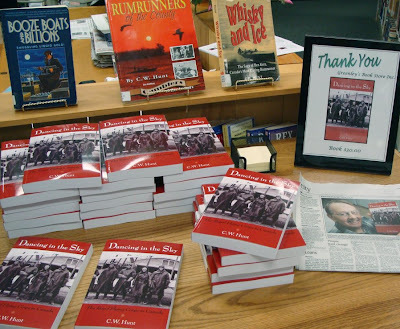 Every single one of the copies of Dancing in the Sky brought to the library by Greenley’s Bookstore was sold, with a long waiting list for the next delivery. Bill Hunt must have a very sore right hand tonight after signing over forty copies of his book. There was quite a long line of people waiting for him to autograph their copies at one point. 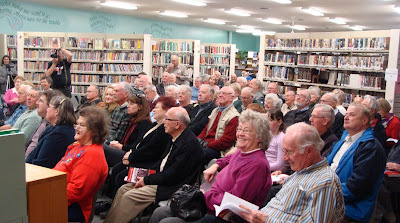 We estimate that 135 people came to hear Bill talk about the training of pilots in Canada during the First World War. His talk was full of interesting facts and contained a number of insights into the great impact that the arrival of the air cadets had upon the economy and people of Deseronto. 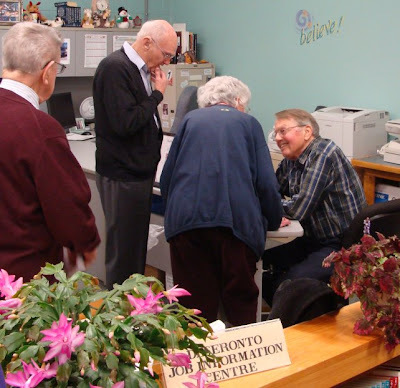 It was a wonderful afternoon and a tribute to the huge amount of work that went into the preparation, particularly by Deseronto’s Librarian, Frances Smith, by Dana Valentyne of the Deseronto Revitalization Program, and by the Chair of the Deseronto Public Library Board, Don Simpson. Many thanks to them, to Deseronto’s Mayor, Norm Clark, for a great welcoming address, and to the sponsors of the raffle prize: Greenleys Bookstore, The Chocolate Room and the Small Town Café and Bakery. Thanks also to Lori Brooks of the Deseronto Job Information Centre (whose domain was requisitioned for the book-signing) and to everyone who came – you helped to make this event a huge success.